“Darling it’s better down where it’s wetter…under the sea”! Are you ready to take a dive? Before you say yes think of all the gear you need to take, and the road you need to travel to get to the diving destination. Hence, choosing the right bag for your equipment is important, because you not only need to store all the gear but to keep it safe as well. The reason why we are dealing with backpacks is because there are so many situations where you simply must put the bag on your back. Every adventurer knows that! 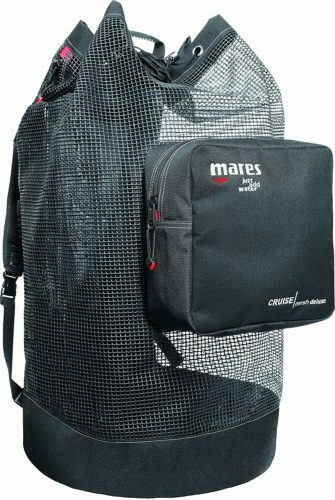 Cruise mesh backpack deluxe by Mares is perfect for your wet gear! It’s made of sturdy PVC mesh net and a thick material that lies against your back securing you from getting wet. It has a drainage extension at the bottom, which is why it’s perfect for taking it right to the diving site upon the arrival. With a drawstring closure, it also has a lateral zip and a sturdy handle, which makes it easy to get to your gear. It also has a wide external pocket for your personal gear. Shoulder sternum straps are ergonomically designed and comfortable. Dimensions are: 16 (H) x 17 (W) x 29 (D) inches. Promate backpack is a practical and affordable carrier for your scuba gear. Although its compartment is medium sized, it has external pockets and compartments for a mask, fins, and snorkel, plus a convenient zipper water bottle pouch. It is made of high-quality materials including heavy duty PVC coated mesh insertion at top and sides for ventilation. 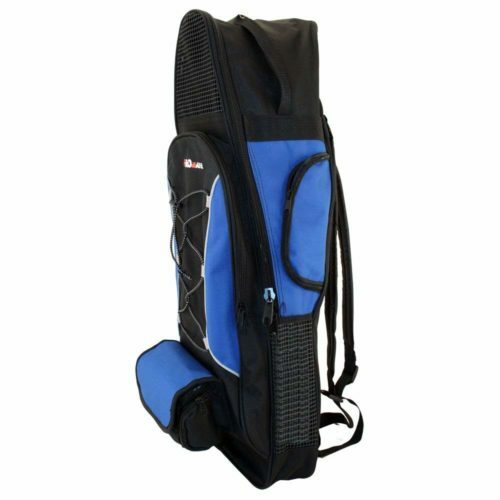 What’s interesting is that Promate backpack style bag features a bungee system so you can add an extra bag or use it for the towels! Its zippers are noncorrosive and shoulder straps comfy and adjustable. Dimensions are: 29 (H) x 10.5 (W) x 5.5 (D) inches. If you need a large backpack to carry just about everything, this one is yours! 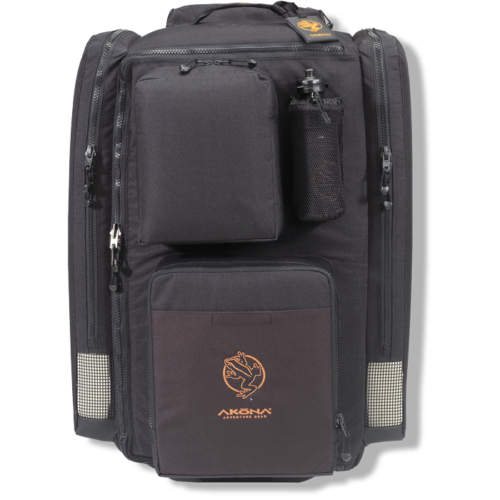 The Akona Roller Dive Gear Travel Backpack is a strong and heavy duty backpack. 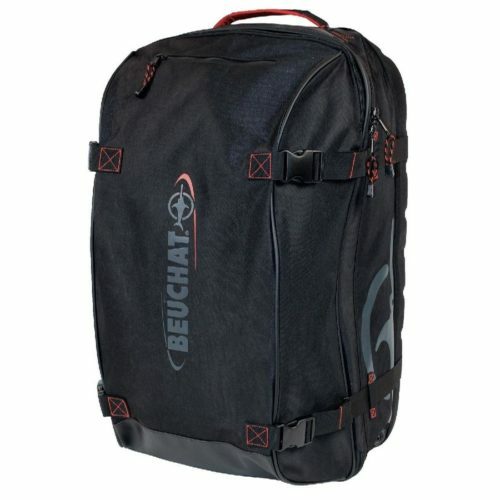 It features durable wheels, padded backpack straps, large pockets and an expansive internal compartment. The good thing about the exterior regulator bag pocket with locking D-ring is that you can take it off and use it as a hand luggage for flying. Two fin pockets are designed to hold two separate pairs of fins, so you can share the Akona roller backpack with someone. Dimensions are: 31(H) x 14 (W) x 21 (D) inches. 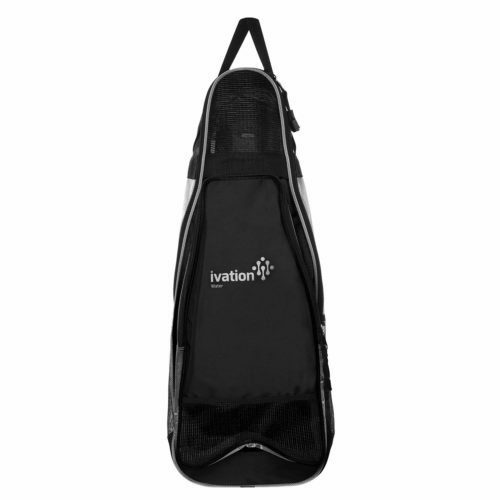 Slender and movable, this is a lightweight and fun diving backpack suitable both for beginners and advanced divers. Coming in pink, blue and black, this backpack from Ivation with a shoulder strap can easily fit your style! The main compartment is spacy, fitted for wetsuit and fins, while exterior pouches are perfect for smaller items. There are also ventilated sections for the wet stuff. Its zippers are very strong making your gear safe and protected when traveling. Exterior clips and adjustable straps are just those little extras, making it even easier to choose it without ever regretting it! Dimensions are 29 (H) x 11 (W) x 17 (D) inches. 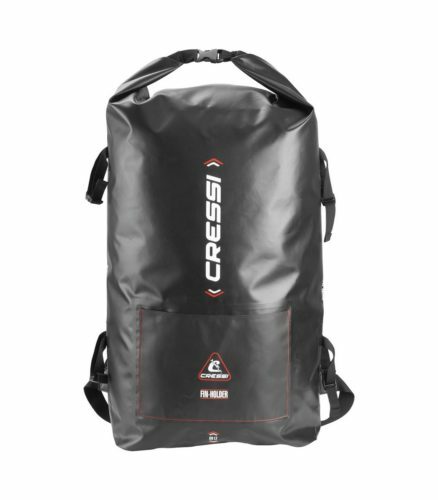 Waterproof and comfortable, this backpack by Cressi is made of black resistant laminated thermo fused Tarpaulin PVC material. It has side fasteners for carrying a spear gun and a special front pocket for storing long fins as the freediving fins. It has a specially designed squeeze-style side-release buckle and a roll-top system with a closure. If rolled it can be used as a grab handle. The shoulder straps are adjustable, while extra stability is ensured with adjustable waist and sternum straps. The capacity of this backpack is 60 liters. Voyager XL can handle all dive gear you can possibly imagine! Both roller bag and the backpack, it offers dual compartments with adjustable telescopic handle and smooth roller wheels. Still, the backpack straps are also removable. Semi-rigid thermoformed EVA back shell gives extra protection for the contents of the bag during transport and handling or while the bag is being rolled. The main compartment is designed for damp gear with a snap hook for an additional mesh bag, drainage vents and mesh side pocket. The second compartment is intended for dry gear with retaining straps. With its capacity of 137 liters, you can surely fit everything into it! Whenever on a dive trip make sure you have a good time and take some photos! If you are serious about the adventures you embark on and want to take a good care of your equipment, you should read about Thule Crossover Backpack 32l. This entry was posted in Reviews, Scuba Diving, Scuba Diving, Water Sports and tagged backpacks, Reviews, Scuba Diving. Bookmark the permalink.